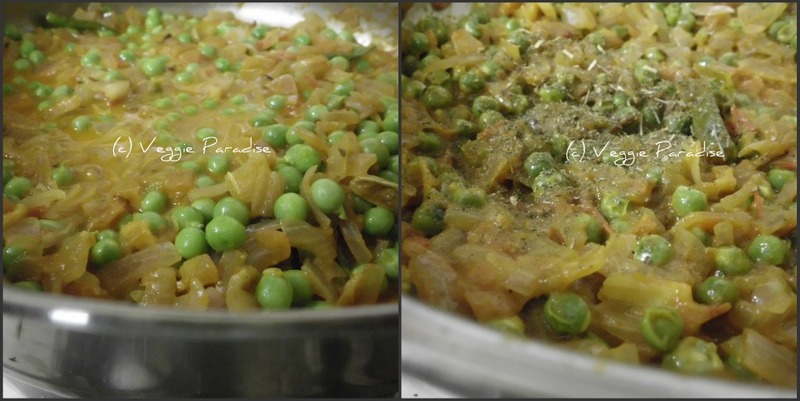 Fresh green peas looks beautiful and blends very well with onion and tomatoes. This recipe is very simple to prepare. 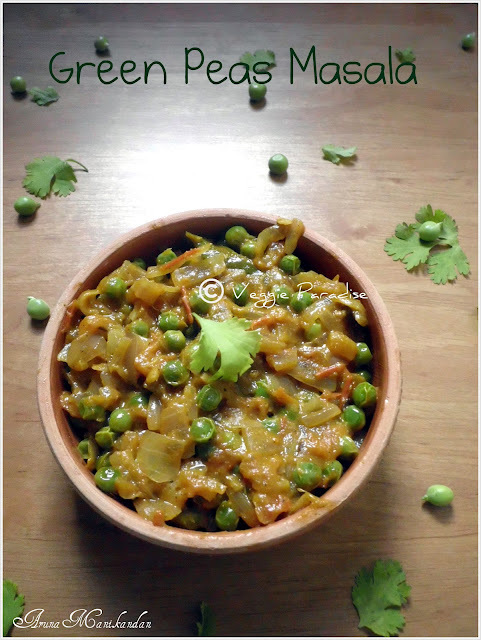 Definitely you will love the combination of onions and mushy tomatoes along with green peas blended with the spices. 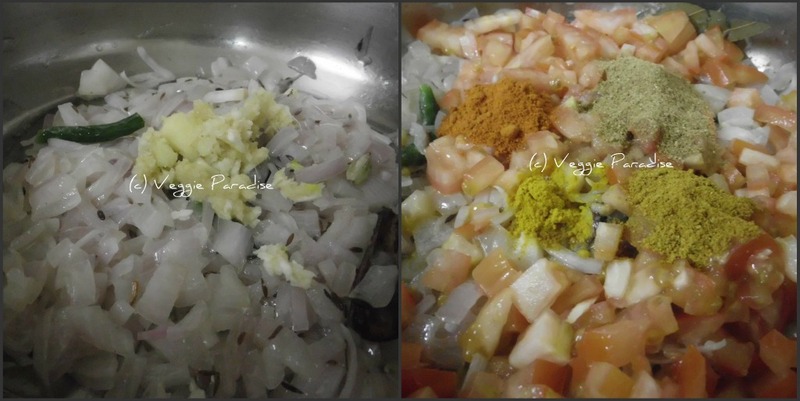 This masala gravy goes very well with a roti . 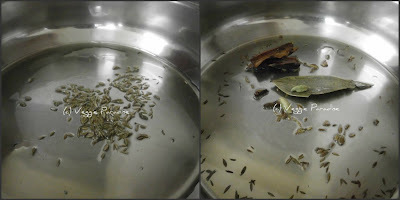 Heat oil in a pan ,add the cumin seeds, fry until dark and then add the bay leaf, cinnamon stick,cloves and cardamom.Fry it for a min. Add the green chillies , saute for a min .Now add the onions and stir fry until soft. Add the ginger-garlic paste and fry for a few seconds . Add the tomatoes and sprinkle in the spice powders . Cover and cook on low heat , until the tomatoes get cooked well and the oil begins to seperate. Stir frequently to prevent scorching. 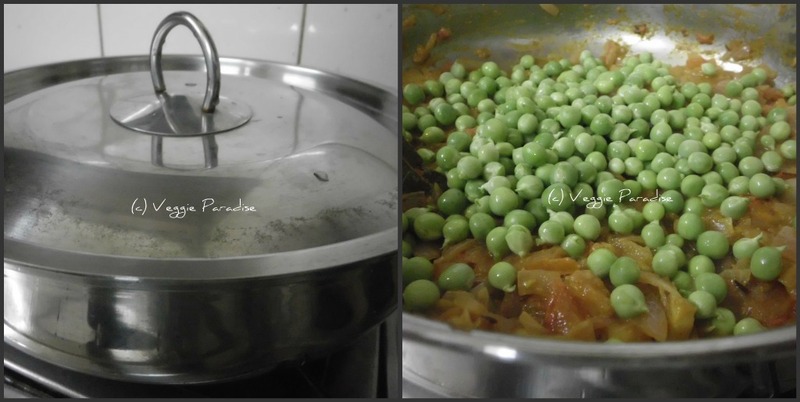 Now add the fresh green peas stir and simmer gently until well blended. 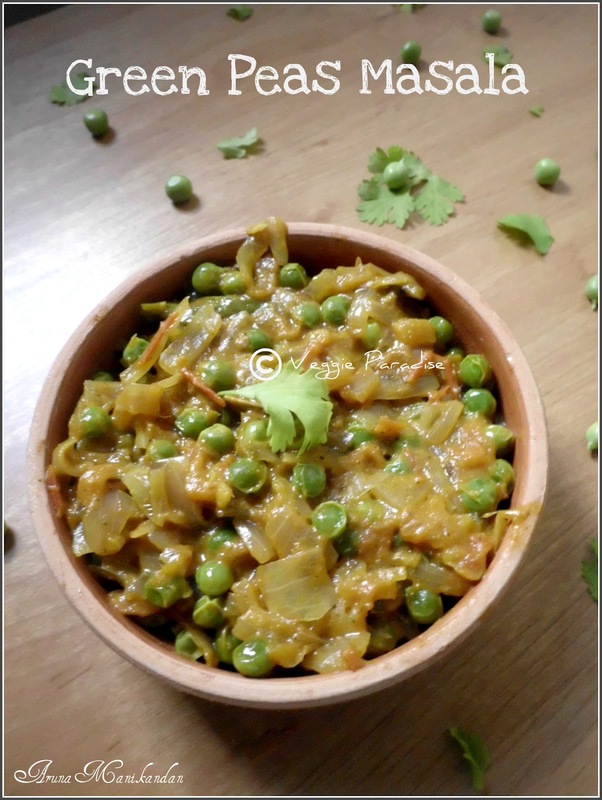 Mix the cornflour with little water and pour in the masala.Add salt,cover and cook until the the peas are just tender. Add more water if necessary. Finally crush and add the fenugreek leaves. Remove from heat and serve hot , garnished with the coriander leaves. Fresh green peas are like a rare thing here.. great to see a recipe using fresh ones. 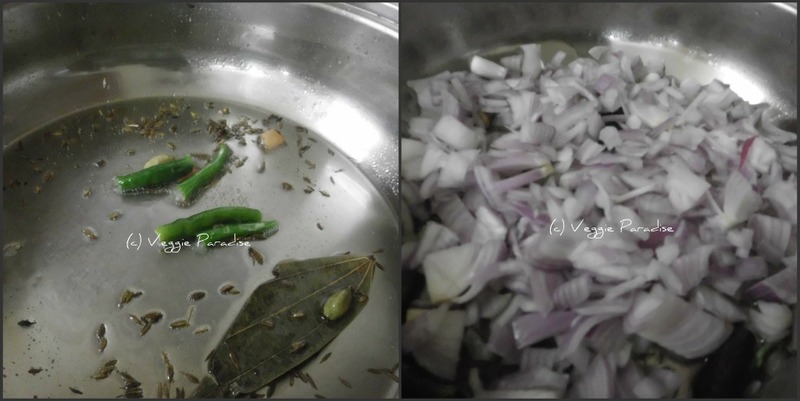 simple and healthy masala...perfect with chapathi! Looks delicious, nice clicks too.. Goes nice with rice and roti.Or we can have it like snack . Nice presentation and flavorful curry. Thank you for visiting my blog. This is the first time I am in your space. I am now following you. Love peas masala, I have not tasted this one in a while. Adding corn flour is a nice tips.looks delicious. Hey, Thank you so much for your lovely comments and being the 100th follower of my blog.. I am so glad today. Even I am first me visitor here and the blog is making me drool here. Happy to follow your blog. Lovely and delicious looking dish ! Thanks for you follow n comments at my space, following u right back.. Very delicious masala,perfect with chapathis!! Very yummy curry , special when fresh peas are available in winter in India. Curry looks super easy and tasty. sounds new & very interesting...great recipe..